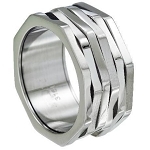 Men who love the look of a handcrafted ring will love the hammered texture of this 7mm stainless steel wedding band. 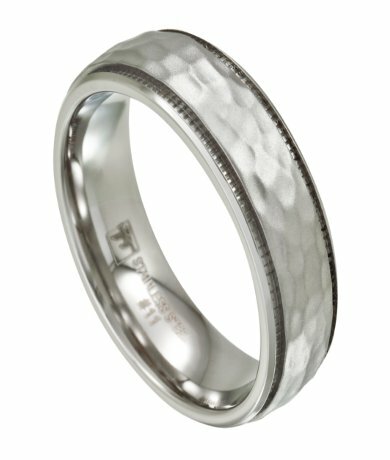 Milgrain bands add a tailored look to this polished alternative wedding ring. Finished with a comfort-fit, this ring is a popular choice! I wanted a cheap ring that looked good for daily work wear. I am in the construction industry. My wedding band is a $4k dollar Platinum piece so I do not wear it daily. I am very happy with the fit and look of this ring. Ring arrived quickly. Picture is accurate. Good quality. I loved this ring online, but it was even more beautiful in person. 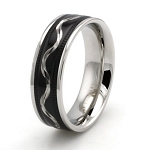 It looks great on my husband's finger, and he is very happy with the way it fits. Great Product. Great Price. Much more durable and I like it more than the $700.00 18kt white gold ring I replaced it with. No more annual dipping and it looks better.